“He was always gonna come after me,” says CIA director Bob Dewey, speaking in regard to the super spy Jason Bourne. One wonders how many CIA directors in this franchise have uttered something similar, shortly before meeting their end in some form. I’m watching Bourne (Matt Damon, returning for the first time since 2007’s Bourne Ultimatum) mow through trained operatives in order to get at the Director and I’m thinking, life and medical insurance policies for these guys must be through the roof. This is why group coverage is so important in the workplace; everything gets to even out a little. 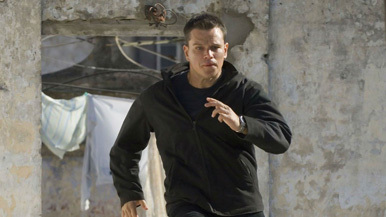 This is the fifth film in the Jason Bourne series; the first three films all centered around a conveniently-amnesiac rogue CIA operative as he attempted to find out who he was, and - one assumes - who’s responsible for his loss of memory and place in the world. The fourth one subbed in Jeremy Renner for Matt Damon, met with lukewarm reception, and remains unseen by me. This one aims to right the ship and bring us back to the identity storyline. To do this, it brings back Paul Greengrass (director of Bournes Two and Three) and Damon, as well as a couple other faces and names from before. The first film in the series, from 2002 and directed by Doug Liman, was shrewd and sort of novel in its approach to the spy genre. Now, of course, we’re at the point where the gritty and realistic action thriller/reimagining has been in vogue, out of vogue, rebooted, and made an erstwhile punchline…even within the current iteration of Bourne’s most obvious cinematic progenitor, the Bond series. The newer series has survived on its own terms, but to margins that have slimmed as it’s gone on. Part of it may be the fact that each film has essentially redressed the same story in different clothes; in one film, the secretive head is Joan Allen, in another it’s David Strathairn, and in this one it’s Tommy Lee Jones. But then, Bond has pretty much done the same thing: every film brings about a new form of Bond Girl and every film adheres to a basic spy-thriller template.